Since you were a child you’ve always dreamed of having your own bake shop and creating mouthwatering desserts and pastries that your neighborhood will want to keep coming back to. What better way to fulfill that dream than to enroll in baking classes at one of the top culinary schools in the country. But the costs of tuition at these schools can be quite prohibitive prompting various sectors to question the value of a culinary school education in jumpstarting a career in the culinary industry. Graduates of culinary schools and those who are only planning to enroll have been raising the issue of soaring tuition costs at culinary schools. Tuition fees alone could begin at $25,000 dollars and this does not even include other incidental costs. Enrolling in top culinary schools could cost someone as much as $100,000 in overall fees. After finishing school, graduates are unable to find jobs that will allow them to begin a decent career in their chosen field, much less to pay off tuition loans that they have made. Sometimes it seems to graduates that they would have been better off apprenticing instead, which is what other industry insiders likewise suggest. A lot of chefs would be the first to tell you that enrolling in baking classes at these top schools is not enough to expect a brilliant career as a pastry chef. There is still so much hard work involved to climb to the top, and yes, you will have to start somewhere in the bottom before you can get anywhere near the top. 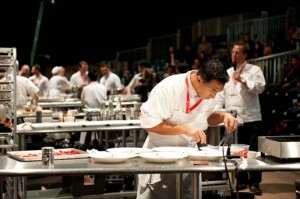 Successful chefs say it took them about 10 years to reach where they are now, enjoying the fruits of their tough labor. So if you took out a loan for your tuition fee at a culinary school, it would probably take you the same number of years to pay off that loan, too. Despite these pronouncements though, there are still benefits to studying at top culinary schools. One of the main things wannabe pastry chefs are after aside from learning from the best is getting to know the leaders of the industry in the hopes of becoming an intern and eventually getting hired. This is true for most people, but in order to get noticed by the top chefs you will also have to shine from among the pack of several others who are also trying to outshine everyone else. If you are confident in your skills, then you will have no problem with this. Defenders of culinary schools continue to assert that enrolling in a baking or pastry program is the quickest way for you to gain expertise in this field. These programs do not normally last as long as other culinary programs so they shouldn’t cost as much, and you will able to reap the rewards more quickly. Learning from various top pastry chefs in the industry is an experience you cannot gain quickly through other means. Whether you do decide to enroll in baking classes at top culinary schools or not, these are some things you should consider first. Weigh the pros and cons, but don’t ever give up on your dream. Becoming a chef is one of the best jobs a person can have due to the benefits it provides in all aspects of life. Restaurants will pay top dollar to a chef in order to ensure that all the food that is provided is going out to customers in an efficient manner. However, just being a chef for a restaurant isn’t the only thing a chef has to work with. The ability to cook is a life-long ability that can serve a purpose in any place that requires food, most obviously your own home. If you are looking to pursue a career as a chef or just an enhanced ability to cook, there are culinary schools will provide that help.